i was back in the motherland for over a month last november. for the first time in several years, enough of my family (ie, one) lived in the same country that it made sense having a permanent place to live. we were close to a rainforest and, in the mornings, a cool mist would sometimes drift in through my window. that was nice. i was working mountain view hours while in singapore, so i woke up late, walked out for breakfast at the town center, and harassed people into meeting me for beverages in the afternoons. i got books out of the library that i didn't have time to read in san francisco and read them all. in my second week home, i started reading the steep approach to garbadale and doing my annual re-read of i heard the owl call my name. one day that week, i woke up just as the sky got light, and had an epiphany. it felt exactly like what w.s. merwin said, that this life does not go all the way. the goog was a sweet gig, but it didn't go all the way, not in the least. it didn't even go another full year. the prospect of still being there at the end of 2008, to be honest, was terrifying in a completely benign-seeming way. it was a variety of low-level existential dread, the kind frogs purportedly don't feel when they boil slowly to death. not to put too fine a point on it. occasionally, everything snaps into focus; maybe it was intuition, or the steep approach to garbadale, or i heard the owl call my name. in any case, before coming back, i'd begun to think about more school but did nothing about it. within an hour of waking up, i'd emailed the usual suspects to ask them to write letters for my applications. after that, time passed rapidly. even before i heard back from schools, i'd begun making alternative plans, just in case. having spent a year making things on the weekends, i thought perhaps it would be a good thing to do that more of the time. through john grew sheridan, i contacted susan working at anderson ranch and put in an application to work the summer session in their wood/furniture/sculpture program and, bizarrely, got in. andy and susie magdanz, friends of glenn and ilene's, offered me a place to stay in cambridge for the first couple of months. it turned out to be an enormous victorian house down brattle street with two cats and two dogs. at the goog, i ramped up the nonprofit earth and maps work, and got the climate project connected to avenue A | razorfish, and google connected to cleanuptheworld.org (the little thing steve and i dreamed up last year has now turned into this). i went to iceland with a fancy new gigapan robot and, with fulbright ben, drove around the island making ephemeral sculpture out of snow, ice, and rock (more on iceland here, here, here, here, and here). in march, i decided i couldn't wait any longer and gave notice. then, through a truly perverse turn of events, dan janzen and winnie hallwachs (from the ACG) showed up at google to give a lecture about genetic barcoding and emergent biological data. through them, and through brad, i got the chance to work on a genomics and structured data project at google--something i'd been trying to do from the time i started (efforts that resulted in the ill-fated visit by ed wilson, jeffrey sachs, and harold varmus, and in miscellaneous attempts with my favourite partner in crime, joel finkelstein, to get google involved with the encyclopedia of life project). with the international barcode of life folks, we went to costa rica to try and save the world (yes, really), with a large list of assorted googlers in train. i extended my time at google as long as i possibly could, then everything came to an abrupt end in may. last day at work on friday, then i packed everything up, sold a stack of books and my burning man tickets, dropped off two large boxes at the salvation army, drove the desk to halsey's house, sold the car, got a valedictory latte at ritual roasters, and had people over for a 36-pack of tecate. i left for colorado before sunrise the following monday. it was epic. anderson ranch was, mildly put, a complete change. nestled in the mountains south of aspen, with bright sun, thin air, no cellphone reception (for me anyway), and internet access whenever we got to the shop computer. when i arrived, the aspens carpeting the mountainsides had just begun to put out the first tiny leaves. we got up at 7am when the sun came in through the apartment windows (not even hiding under the blanket would prevent it from doing so), biked up the mountain to the ranch for breakfast, and usually rode down through the sprinklers in pitch darkness after midnight; our apartment got into the habit of early morning pasta meals. 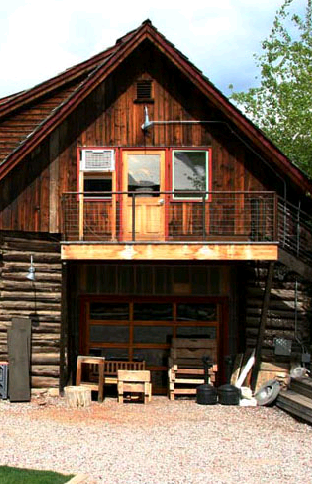 the maloof wood barn at the ranch. here, we spent all our time. having 24-hour access to the biggest, best-equipped shop i'd ever been in made me want to try all sorts of hare-brained things. i got into the groove of making things and watching them fail, then trying again. i made pointless things, like clouds. i painted things weird colours and also no colour. i stood around in classes learning things i never really even thought about. some of the lectures were really great (like this, and this). the people i worked with were bizarre and marvellous, and made magnificent things--staff, students, faculty (there was a marvellous run of weeks with paul bowen, wendy maruyama, merryll saylan, and tom huang that will stay with me for a long time), and especially my fellow peons whose work i'd link to if only they had online portfolios. local art patrons had us over to marvel at their collections. when we could get away on the weekends, we took the free bus into aspen to observe the lives of the wealthy and tasteless, avail ourselves of a magnificent library built with their tax dollars, and get mildly discomposed at the local (only) dive bar. i left only twice, once for for catherine and zach's wedding in sundance, then again for sci foo camp (hitting up quince along the way). four months later, we were all wiped out and ready for the summer to end. it was getting cold again and the aspens were beginning to turn. after the last class of the season, it was like the ranch took a deep breath and exhaled everyone to much needed time away. my last weekend there was strangely quiet after many weeks of the opposite. the holiday messed everything up, and my stuff followed bland to jackson hole before getting shipped out east. i showed up in cambridge with just a backpack on one of the hottest, most humid nights of the summer. the house on appleton street had high ceilings and tall windows opening out onto trees. those first two weeks before the start of school were full of leaf-filtered light in the mornings, and waking up with a cat on the bed. i developed a fondness for almond butter and honey on a freshly-toasted english muffin. ami came out to visit and we ate at craigie street just before it left craigie street. school started in mid-september and i saw the sociology department for the first time ever. in october, i moved into a house down the street from william james hall. 3 storeys with 9 other people in it, and minimal insulation. the house runs as much like a well-oiled machine as a house containing 10 people can be expected to do. there is a lot of cooking, mostly of lentils, and we wear sweaters often. there was a backyard party to celebrate the end of the fall; matt made 50 pounds of slow-roasted beef brisket. classical social theory, economic sociology, stratification, the social psychology of organizations, and a class in letterpress printing by michael russem of the kat ran press (more here and here) somehow ate up the last 14 weeks--i don't know where the time went. they keep telling us that we'll be with our colleagues for the rest of our professional lives. for a surprisingly large number of classmates, i'm glad this is the case. sabeel says graduate students are the only professionals whose labour isn't alienated. i'm not sure that's completely true, and ritual roasters is 3096 miles away but, even so, the best ice cream, pad thai, and sandwiches in the world (well, maybe not the sandwiches, but they're still pretty damn good) are within walking distance, i've seen ferran adria speak in person and tara donovan's retrospective at the ICA, and they pay me to think about stuff i care about. it hasn't always been a great year, but i'd say things are pretty good.